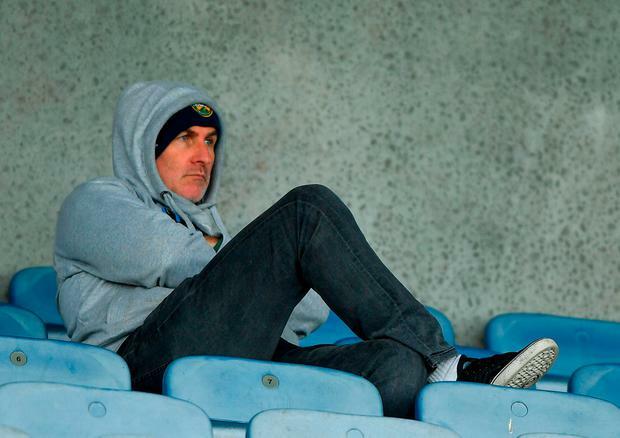 The future of Offaly football boss Stephen Wallace is shrouded in doubt after a dressing-room bust-up involving players and management at half-time of their shock Leinster SFC defeat to Wicklow on Sunday. Relations between Wallace and many of his squad are rumoured to have reached crisis point, with sources close to the Faithful camp revealing that demands are being made for the Kerry native to step aside before the qualifiers. It comes on the back of a seismic extra-time reversal at the hands of the Garden County - who finished without a win at the bottom of Division 4 earlier this year - which was highlighted by a series of bizarre events. Offaly forward Nigel Dunne - their top scorer in Division 3 as relegation was avoided narrowly with a last-day defeat of a weakened Westmeath side - was hauled off after just 28 minutes. Regular free-taker Dunne - who had 12 possessions within that time - couldn't hide his disgust at the substitution while last year's captain Sean Pender was also furious after being called ashore in the 40th minute. Dunne would return to the fray in the 53rd minute after being involved in a heated half-time argument with management but would later see his second-half penalty saved by Wicklow goalkeeper Mark Jackson. Michael Brazil was also removed and re-introduced in extra-time as Wallace watched on from the stands as he serves an eight-week ban for an unsavoury sideline incident in a Kerry club game. Wallace was already believed to have been on the brink earlier this year after four straight NFL defeats, with many questioning the absence of experienced players from his panel. Johnny Moloney, Graham Guilfoyle, Eoin Rigney and David Hanlon are just a few regulars who have not featured prominently under Wallace's reign, which sees him franked by fellow Kingdom natives Billy Sheehan and Brendan Kealy. That combined with the unavailability of teenage attacking star Cian Johnson due to an internal rule that commits him to the U-20 competition and this defeat has left his term in charge in serious jeopardy. Former Faithful star Alan McNamee was one of many to voice their concern on social media in the aftermath of what well-known Offaly referee Brian Gavin branded as "one of the darkest days" in the county's history.